At MASCOT, you will find products for all kinds of weather. Do you e.g. work where the temperature at times is high? Maybe you work outside on hot summer days? Then, a pair of practical shorts are the solution for you. In order to ensure a high quality, the shorts in the assortment are reinforced with triple stitched seems on the legs and crotch. This ensures an ultimate comfort, which at the same time extends the products’ life. Is functionality important to you when choosing workwear? Do you need e.g. additional room for tools? 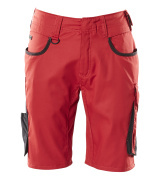 At MASCOT, you will find shorts with and without holster pockets. Again, high durability is ensured. 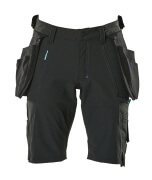 The pockets are typically made of CORDURA®, which is known for ultimate durability. At the same time, you will find products in the assortment where the bottom of the holster pockets and ruler pocket are produced in the puncture resistant material Kevlar®. If your work requires visibility, you can find shorts that are produced in fluorescent materials and with the EN ISO 20471 certification. In order to ensure complete safety, the products have also had a Teflon® treatment, which ensures that your shorts are dirt resistant so that the product will remain visible for a longer period of time. MASCOT has made sure to include space for attachment of logo, so the visibility certification is maintained when the logo is attached (within a certain size limit). 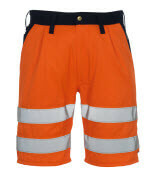 If visibility is not essential at your workplace, MASCOT offers a wide selection of shorts in neutral colours that will easily fit into your current collection of workwear.